This article is about the Roman goddess. For other uses, see Minerva (disambiguation). Minerva (/mɪˈnɜːr.və/; Latin: [mɪˈnɛr.wa]; Etruscan: Menrva) was the Roman goddess of wisdom and strategic warfare and the sponsor of arts, trade, and strategy. From the second century BC onward, the Romans equated her with the Greek goddess Athena, though the Romans did not stress her relation to battle and warfare as the Greeks did. Following the Greek myths around Athena, she was born of Metis, who had been swallowed by Jupiter, and burst from her father's head, fully armed and clad in armor. Jupiter forcibly impregnated the titaness Metis, which resulted in her attempting to change shape (or shapeshift) to escape him. Jupiter then recalled the prophecy that his own child would overthrow him as he had Saturn, and in turn, Saturn had Caelus. Fearing that their child would be male, and would grow stronger than he was and rule the Heavens in his place, Jupiter swallowed Metis whole after tricking her into turning herself into a fly. The titaness gave birth to Minerva and forged weapons and armor for her child while within Jupiter's body. In some versions of the story, Metis continued to live inside of Jupiter's mind as the source of his wisdom. Others say she was simply a vessel for the birth of Minerva. The constant pounding and ringing left Jupiter with agonizing pain. To relieve the pain, Vulcan used a hammer to split Jupiter's head and, from the cleft, Minerva emerged, whole, adult, and in full battle armor. She was the virgin goddess of music, poetry, medicine, wisdom, commerce, weaving, and the crafts. She is often depicted with her sacred creature, an owl usually named as the "owl of Minerva", which symbolised her association with wisdom and knowledge as well as, less frequently, the snake and the olive tree. Minerva was worshipped at several locations in Rome, most prominently as part of the Capitoline Triad. She was also worshipped at the Temple of Minerva Medica, and at the "Delubrum Minervae", a temple founded around 50 BC by Pompey on the site now occupied by the church of Santa Maria sopra Minerva. The Romans celebrated her festival from March 19 to March 23 during the day which is called, in the neuter plural, Quinquatria, the fifth after the Ides of March, the nineteenth, an artisans' holiday. A lesser version, the Minusculae Quinquatria, was held on the Ides of June, June 13, by the flute-players, who were particularly useful to religion. In 207 BC, a guild of poets and actors was formed to meet and make votive offerings at the temple of Minerva on the Aventine Hill. Among others, its members included Livius Andronicus. The Aventine sanctuary of Minerva continued to be an important center of the arts for much of the middle Roman Republic. As Minerva Medica, she was the goddess of medicine and physicians. As Minerva Achaea, she was worshipped at Lucera in Apulia where votive gifts and arms said to be those of Diomedes were preserved in her temple. Her worship also was spread throughout the empire. In Britain, for example, she was syncretized with the local goddess Sulis, who often was invoked for restitution for theft. In Fasti III, Ovid called her the "goddess of a thousand works". Minerva was worshipped throughout Italy, and when she eventually became equated with the Greek goddess Athena, she also became a goddess of battle. Unlike Mars, god of war, she was sometimes portrayed with sword lowered, in sympathy for the recent dead, rather than raised in triumph and battle lust. In Rome her bellicose nature was emphasized less than elsewhere. Minerva is featured on the coinage of different Roman emperors. She often is represented on the reverse side of a coin holding an owl and a spear among her attributes. Stemming from an Italic moon goddess *Meneswā ('She who measures'), the Etruscans adopted the inherited Old Latin name, *Menerwā, thereby calling her Menrva. It is presumed that her Roman name, Minerva, is based on this Etruscan mythology. Minerva was the goddess of wisdom, war, art, schools, and commerce. She was the Etruscan counterpart to Greek Athena. Like Athena, Minerva burst from the head of her father, Jupiter (Greek Zeus), who had devoured her mother (Metis) in an unsuccessful attempt to prevent her birth. By a process of folk etymology, the Romans could have linked her foreign name to the root men- in Latin words such as mens meaning "mind", perhaps because one of her aspects as goddess pertained to the intellectual. The word mens is built from the Proto-Indo-European root *men- 'mind' (linked with memory as in Greek Mnemosyne/μνημοσύνη and mnestis/μνῆστις: memory, remembrance, recollection, manush in Sanskrit meaning mind). The Etruscan Menrva was part of a holy triad with Tinia and Uni, equivalent to the Roman Capitoline Triad of Jupiter-Juno-Minerva. As a patron goddess of wisdom, Minerva frequently features in statuary, as an image on seals, and in other forms at educational institutions. The Seal of California depicts the Goddess Minerva. Her birth fully-grown parallels California becoming a state without first being a territory. According to John Robison's Proofs of a Conspiracy (1798), the third degree of the Bavarian Illuminati was called Minerval or Brother of Minerva, in honor of the goddess of learning. Later, this title was adopted for the first initiation of Aleister Crowley's OTO rituals. Minerva Schools at KGI is a global four-year undergraduate program. Minerva Hospital for Women and Children is a first-class hospital in Chengdu, China. A statue of Minerva is displayed by the University of North Carolina at Greensboro and is the university's new graphic identity starting 2004. A small Roman shrine to Minerva stands in Handbridge, Chester. It sits in a public park, overlooking the River Dee. A statue to Minerva was designed by John Charles Felix Rossi to adorn the Town Hall of Liverpool, where it has stood since 1799. It remains extant and was restored as part of the 2014 renovations conducted by the city. The Minerva Roundabout in Guadalajara, Mexico, located at the crossing of the López Mateos, Vallarta, López Cotilla, Agustín Yáñez, and Golfo de Cortez avenues, features the goddess standing on a pedestal, surrounded by a large fountain, with an inscription that says "Justice, wisdom and strength guard this loyal city". A bronze statue of Minerva stands in Monument Square (Portland, Maine). "Our Lady of Victories Monument" dedicated in 1891, features a 14-feet-tall bronze figure by Franklin Simmons atop a granite pedestal with smaller bronze sculptures by Richard Morris Hunt. A sculpture of Minerva by Andy Scott, known as the Briggate Minerva, stands outside Trinity Leeds shopping centre. Minerva is displayed as a statue in Pavia, Italy, near the train station, and is considered as an important landmark in the city. Minerva is displayed as a cast bronze statue in the Minneapolis Central Library, rendered in 1889 by Jakob Fjelde. Minerva is displayed as a 7-ft statue in the Science Library at the State University of New York at Albany and is on the official academic seal of the University. Minerva is displayed as a bronze statue in Frederick Ruckstull's 1920 Altar to Liberty: Minerva monument near the top of Battle Hill, the highest point of Brooklyn, New York, in Green-Wood Cemetery. Minerva is displayed as an 11-ft statue in Antonin Carlès's 1895 "James Gordon Bennett Memorial" in New York City's Herald Square. A statue of Minerva is displayed at Wells College outside of Main Building. Each year, the senior class decorates Minerva at the beginning of the fall semester. Minerva remains decorated throughout the school year; then during the morning of the last day of classes and after singing around the Sycamore tree, the senior class takes turns kissing the feet of Minerva, believed to be good luck and bring success and prosperity to all graduation seniors. A statue of Minerva stands atop the Ballaarat Mechanics' Institute in Ballarat, Victoria, Australia. There is also a mosaic tile of Minerva in the foyer of the building as well as a whole theatre name after her, called the 'Minerva Space'. ^ Larousse Desk Reference Encyclopedia, Book People, Haydock, 1995, p. 215. ^ Encarta World English Dictionary 1998–2004 Microsoft Corporation. ^ Candau, Francisco J. Cevallos (1994). Coded Encounters: Writing, Gender, and Ethnicity in Colonial Latin America. University of Massachusetts Press. p. 215. ISBN 0-87023-886-8. ^ Philosophy of Right (1820), "Preface"
^ Schmitz, Leonhard (1867). "Achaea (2)". In Smith, William (ed.). Dictionary of Greek and Roman Biography and Mythology. 1. Boston. p. 8. ^ R. S. O. Tomlin (1992). "Voices from the Sacred Spring" (PDF). Bath History. 4: 8, 10. Archived from the original (PDF) on 2015-09-23. ^ Mark Cartwright. "Minerva". Ancient History Encyclopedia. ^ "American Numismatic Society: Browse Collection". Retrieved 2017-03-02. ^ "California State Symbols". California State Library. ^ Cavanagh, Terry (1997). Public sculpture of Liverpool. Liverpool University Press. pp. 70–1. ^ Elson, Peter (2014-10-14). "Liverpool Town Hall's Minerva statue restored to heavenly condition". Liverpool Echo. ^ "Our Lady of Victories (The Portland Sailors and Soldiers Monument)". Public Art Portland. Retrieved 28 January 2017. ^ "Maine Civil War Monuments: Portland (Monument Square)". Maine.gov. Archived from the original on 2015-05-24. Retrieved 28 January 2017. ^ "Minerva". Hennepin County Library. ^ "University at Albany – SUNY -". albany.edu. ^ "Herald Square Monuments – James Gordon Bennett Memorial : NYC Parks". ^ "minerva | Search Results | Wellsipedia". wellsipedia.wordpress.com. Retrieved 2017-03-09. ^ Citizen, Erik Sorensen / Special to The. "Wells College to graduate its first males this weekend". Auburn Citizen. Retrieved 2017-03-09. ^ York, Michelle (2005-09-06). "Wells College: Newly, and Uneasily, Coed". The New York Times. ISSN 0362-4331. Retrieved 2017-03-09. ^ "Ballaarat Mechanics' Institute - All are welcome to visit for tours, cultural events and exhibitions". Ballarat Mechanics Institute. Retrieved 2019-03-09. Origins of English History see Chapter Ten. Romans in Britain – Roman religion and beliefs see The Roman gods. 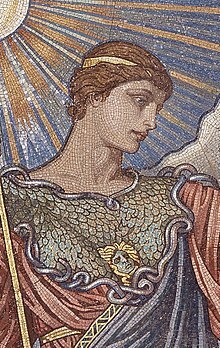 Wikimedia Commons has media related to Minerva.